The most difficult investment decision investors make is not to own a stock. Though the “don’t buys” never end up in a portfolio, they often represent some of the best and worst decisions I’ve made. Say you consider buying two stocks. You buy one and it goes down. The one you didn’t choose skyrockets. The difference between those two returns is the opportunity cost. What you would have made on your investment if you chose the bullet stock rather than the sinker. And yet, we are compelled to narrow the variables and to make an educated decision when we purchase a stock if we want to grow our assets over time. Let’s compare the history of two major technology companies and their stocks: Apple Computer and Hewlett-Packard. At the beginning of last year pundits were discussing both stocks as potential buys. Apple had just come off another stellar Christmas sales season and Hewlett had a new shine thanks to the hiring of Meg Whitman (former E-Bay CEO and candidate for governor of California) to clean up the mess left by a succession of CEO’s and a pile of debt. So which stock was a buy and which a don’t buy? 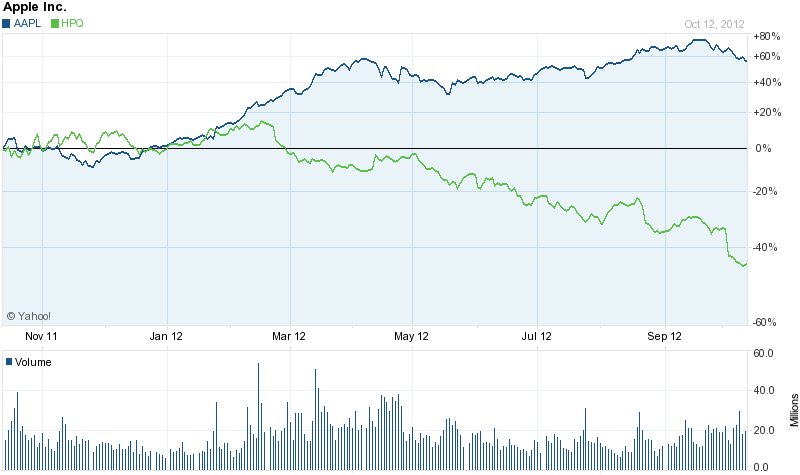 AAPL’s price at the opening of 2012 was $409.40; HPQ traded at $26.32. Certainly for small investors buying HPQ was more manageable investment allowing them to buy 15.5 shares of HPQ for every one share of AAPL. But absolute price means nothing when buying stocks. It’s all relative. The important measure when buying stocks is to understand how fast the company is growing and how much you, the investor, are paying for that growth. On that measure which was the greatest bargain? Earnings growth estimates for 2012 over 2011 were one half of one percent for HPQ and 21% for AAPL. Investors were paying 5.7 times the slowly growing 2012 earnings for HPQ (the price earnings ratio or p/e) and 10.4 times 2012 the much faster growing earnings for AAPL. Both stocks were trading at a discount from their historical levels and both were trading below the p/e for the entire market–that is a good thing. While HPQ was cheaper on a p/e basis, the slow earnings growth was a warning signal. Sometimes stocks are cheap for good reason. Terminally cheap we like to call them. AAPL’s earnings growth was impressive and at 10.4 times earnings, a bargain. Just four years earlier AAPL’s p/e was 43.5 times earnings. Either AAPL was cheap at the beginning of this year or investors didn’t think the stock could continue that growth rate. As a college professor I noted that all but one of my students carried AAPL laptops. That told me something about future trends for the company’s growth. In December I entered an AAPL store to purchase a Christmas present for my husband and the scene was something I imagined from a Filene’s basement sale in the sixties. Buzz, chaos, commerce. The trends matter. Are people clamoring for HPQ laptops or iphones? While valuation (the p/e) matters, growth matters more. I owned AAPL but added to my holdings and sold every last share of HPQ. See the chart below comparing the performance of the two. The investment strategy worked though that is not always the case (which is why we own more than one stock) but the lesson is instructive: growth and valuation matter. So does your gut. The opportunity cost in this case? A spread of almost 100%.